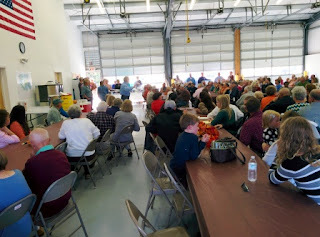 October 30, 2015--The last time we went on the road--to the Midwest for four weeks during the summer--we had plenty of tricks waiting for us when we returned. The first week we were gone, a woman from the neighborhood lost control of her car and turned it over in our adjacent neighbor's yard. The accident took out an electrical transformer and created a significant power surge. So significant that it blew every controller in our house. We lost our refrigerator, the swim-spa controllers, our heated mattress pad, some GFIs, and the sprinkler system. The refrigerator was the worst: All the food (about $350 worth) was putrified, and the refrigerator had to be replaced. Worst of all were the flies. Where did they come from? I don't even want to think about it. The good news is we had an early Halloween treat: The auto insurance finally settled the claim--in full. My checkbook is grateful. So, we hope not to have any more tricks. We are experiencing some treats, however. Yesterday we left home for a trip up to North Carolina. Jim's uncle Webster is celebrating his 90th birthday. It will be a small party...his daughter says she has confirmations from 196 people! Webster is quite popular in this small farming community. We took our time driving up. We actually stopped in Brunswick, Ga., and had an oil and lube job done on Junior. We then drove another few hours and stayed the night at a Walmart in Florence, S.C. We woke up to chilly weather. We definitely don't need the AC, but we do need some warm blankets. We are now dry-camping in Webster's backyard. We will be here for a couple of days. We would like to go to North Carolina's barrier islands and fish for a few days, but we are having trouble finding economical RV camping. If we don't go to the islands, then we may go to the mountains. Who knows? It is rather nice not having a schedule and just being able to relax. Oh...one more thing: I am pleased with my new AT&T hotspot. Until recently, this area of North Carolina was hostage to one small cellular company. None of the big networks worked. I was pleased to find that AT&T now has service here...at least most of the time. And my hotspot works great. August 21, 2015—We’ve been back almost a week, and I am finally taking a look back at our 4 1/2 week adventure. We had electrical problems. No AC for the first day. Jim still has to solve the electrical problems with a permanent fix, but at least he had a work-around so that we had lights and AC. We had limited internet. I will not use T-Mobile any longer for a mobile hotspot. Although I checked ahead of time that I would have 4G connection, I rarely had it—only in big cities or along the interstate. We had car-battery problems. We anticipated that the battery would die; Jim needs to put some type of trickle charge on the battery to keep it charged while the car is being towed. But we had another problem, too, which turned out to be a bad battery connection. The bright side: We learned how to get a car out of park when the battery is completely dead. And we learned about some fuses on the battery cable that need a good connection. Oh, and yesterday, we replaced the battery in the car. It finally died altogether. We had a near-accident. When the tow-bar hitch pin broke, the tow bar fell off the car, while we were traveling 60 mph. One of the safety cables also broke. Luckily (very luckily) we had no permanent or bad damage to either the car or the motorhome. Our trip was “highlighted” at the end by coming home to a dead refrigerator and putrid, month-old spoiled food. The problem was caused by an auto accident outside of my neighbor’s yard. A woman from down the street hit the transformer in the front yard, wedged the car between the transformer and the cable box, and turned the car on its side. The accident took out power for the whole neighborhood and caused a surge that took out the fridge. I now have a new refrigerator. I don’t know how much I will get back for the fridge and the spoiled food. We traveled 3,048 miles round trip, spent $840 on diesel and only $587 on RV parks. I did not track our food expenses, but we did not eat out all that often. Neither did I track our amusement expenses. All in all, though, for having spent 34 nights on the road, it was not an expensive vacation. Most important: We had a good time. My best times, of course, were spent with my family and with my Peru Group friends. But I enjoyed all of the trip. Jim is ready to go again, but it will probably be October before we head out somewhere, because of medical appointments. August 15, 2015—Carrabelle, Fla., is a small gulf-coast town on the Forgotten Coast. It is so small—or was so small—that in 1959 there was only one police officer. In the 1960’s, the force increased to two, and the police station was a call box bolted on a building at the intersection of two streets. Because the police would get soaked when it rained, the phone company finally built them a phone booth. It was recognized as the “World’s Smallest Police Station.” The phone booth still exists. 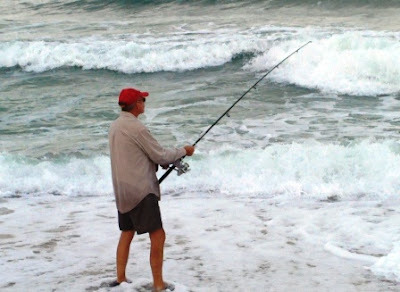 Carrabelle does not offer much in the way of fancy dining, but it offers great gulf fishing. 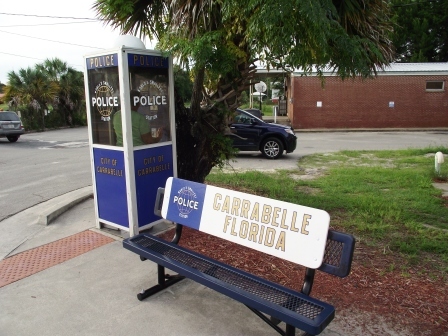 The old Carrabelle police station--the world's smallest police station. 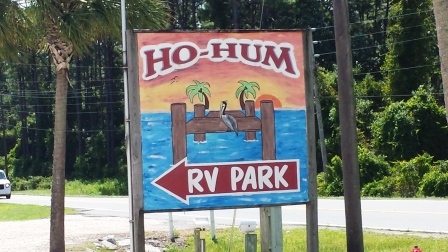 We are located at HoHum RV Park just outside of the city limits. Our motorhome faces the gulf. Yesterday, after checking the local charts to find out the best fishing times, and we hit the pier at 3 p.m. when the fish were supposed to be hungry. We had bought some frozen shrimp for bait. I baited my line, cast it, and within minutes I had a strike! What did I catch? A shark! It was a black-tip. Although these sharks are edible, we unhooked it and threw it back in to grow up a bit more. (I may have seen its mother or father or big brother swimming in front of our coach last night. I saw the shark fin in the water, just yards off the beach.) I caught three or four fish yesterday. Jim caught one or two, I believe. 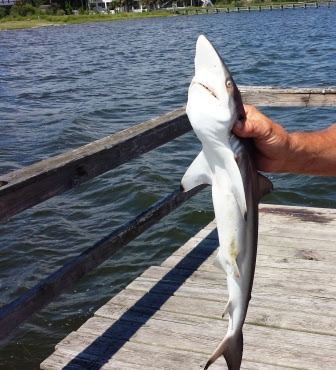 My first catch--a black-tipped shark! 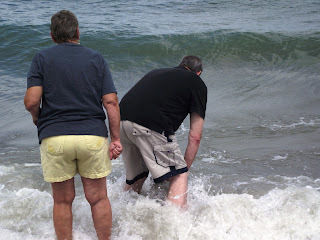 Today, the charts again said the fish would feed between 3 and 5 p.m., so we headed to the pier. It was a catchin’ day, although the catches were not keepers. Almost every cast brought tugs on my line. The fish were very hungry, and we accommodated them. A few also accommodated us. Altogether I caught about six or seven fish of various species, including a black sea bass (too small to keep), and an ocean catfish. Jim also caught a catfish and a couple other small fish. We were told that the catfish were “trash,” not worth keeping. So we threw them back in. Probably a mistake. I researched ocean catfish this evening. The species we caught was the hardhead catfish. You have to be careful when touching them, because they have poisonous spines (not fatal, just painful), but everything I read said that these fish are edible and have a mild flavor, similar to snook. Last night, we also did some night fishing. We didn’t have much luck (we’ll try again this evening), but it was fun—made even more enjoyable as we watched fish jump and create a phosphorescent swirl in the water. The phosphorescence is created by the bioluminescence of tiny organisms in the water. Cool! It is our last night here. In a few minutes, we will go out and fish for the last time. Who knows? Maybe we will even catch tomorrow’s dinner! Tomorrow we pack it in and head home. Our vacation will be over, but we have resolved to come back here. It is just so relaxing! August 15, 2015--The sky sparkled with stars. The Milky Way was visible. In the far distance, we could see lightning; it was far out into the gulf, no threat to us on the fishing pier. We dipped our lines, but did not have even one nibble. Yet, we had a most enjoyable evening on the pier.The reason: the phosphorescent salt water. Whenever we cast out our lines, the bait hit the water with a splash that glowed. The hooks sank and waited...and waited. But the fish were not hungry. They were there, right in front of us, by the hundreds. How did we know? Every time a big one jumped, schools of little fish scurried in the water. Each of them left a trail of luminescence. How cool was that? Jim and I were mesmerized by the bioluminescence. It was truly entertaining. I could not take a picture of the phenomena; the trails were sporadic and did not last long enough to capture. Our last fishing adventure in Carrabelle did not give us dinner. 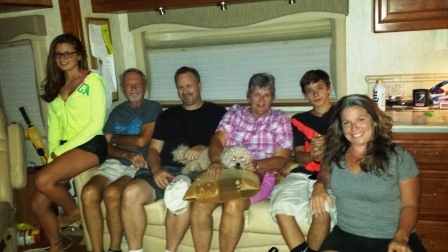 Instead, it gave us a memory to last a lifetime--or until the next time we visit HoHum RV Park again. August 14, 2015—What a way to end a vacation—a vacation of more than four weeks. 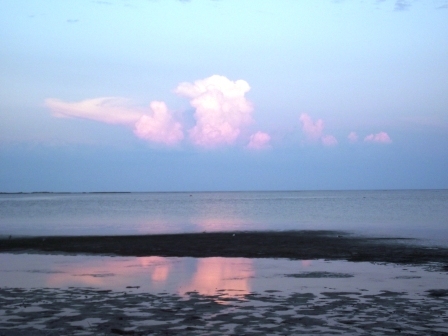 We are in paradise, a spot of leisurely heaven located on the Forgotten Coast of Florida. The Forgotten Coast is just that: few tourists, few residents. Lots of coast, water, sun, fun. It is in the panhandle of Florida, away from the hustle and bustle of the big tourist traps. 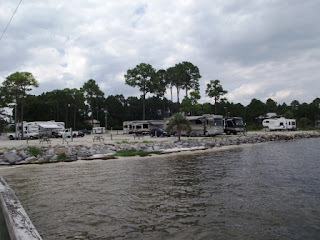 We found this RV park through a blog. Called HoHum RV Park, it is, well, ho-hum. Its rules say it is only for adults—no kids allowed. It has no amenities to speak of—no pool table, no swimming pool, no clubhouse. What it has is the Gulf of Mexico, free cable TV (with a comprehensive list of channels, none of that basic stuff), and free excellent wifi. It’s the best wifi we have experienced in any RV park. 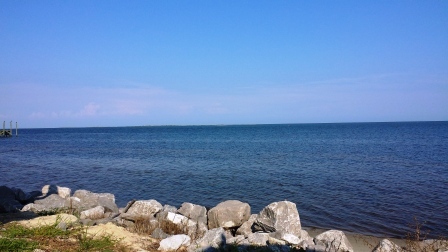 All of the sites in the park have a view of the gulf, but ours is parked front-window-facing the water. 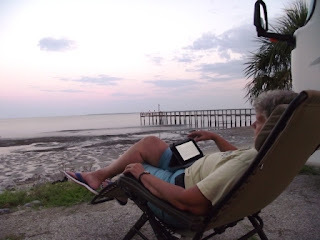 I am not one to sit outside, but last night that is what we did, until nightfall. After dinner Jim went out again and stayed outside until a storm threatened. He was looking for meteors. He also enjoyed actually seeing the Milky Way, which is not visible in the light-contaminated skies of Jacksonville. At one point last night, he came in and showed me his tablet. He called up the weather map, curious to know how far south/southwest lightening strikes were occurring. The map showed they were all the way down by Tampa! Remarkable that we could see the light up here in the Panhandle. Later, around 2 a.m., Jim came in and asked if I was still awake. He beckoned me to the front of the RV, to look out at the threatening rain storm. The wind was picking up; slightly white-capped waves lapped the rocks below our motorhome. Then the sky opened up with sheet lightening. Spectacular. Finally, rain pelted our fiberglass box. We were cozy as the rain came down. We are here to fish and to relax. Fishing (as usual) has not been good. But I don’t care. If I catch anything, I will post a picture. But no one has been catching. It doesn’t matter. It is just nice to sit back and relax. That’s exactly what I plan to do right now. August 12, 2015—Sunshine is delightful. It caresses your skin, makes you feel warm inside. Especially when the temperature hits the 90+ mark and you are sitting in a 40-foot long aluminum box called a motorhome. We bought our motorhome more than two years ago “as is,” which meant that La Mesa (the dealer) did not repair anything that was not functioning, except for safety issues. Before we purchased Junior, however, we talked with the technician, who had gone over the coach from head to toe. He told Jim the things that needed to be fixed. (We now know he had not found everything, but that is par for the course when you buy a pre-owned motorhome.) Included in his list were two awnings—the little one over the entryway and big one over the kitchen slide. 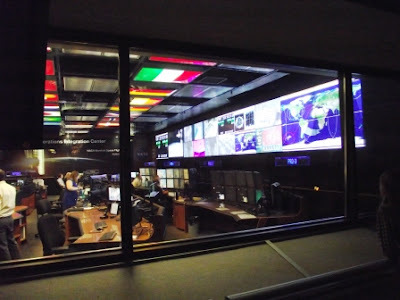 Both are products of Carefree of Colorado; both are automatic awnings with anemometers, which measure wind speed and communicate with the awnings electronic boards. When the wind gets too gusty, the awnings are supposed to fold up automatically. Nice feature, if it works. The technician had told us that neither of the automatic awning worked: The electronic board in the small awning needed to be replaced, but he said that the automatic feature of the big awning could be by-passed and the awning would work manually. The awnings have not been a priority issue with Jim, but this week he finally had the opportunity to look at them. The technician was probably correct about the little awning. He was right about the big awning. Jim found wires that were not connected. When he connected them, voila! We have awning! Mr. Fixit does it again. 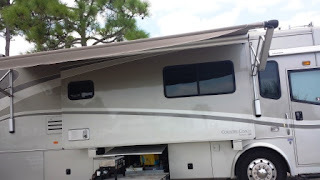 The awning will help reduce the load on our air conditioner, and we will enjoy our couple of days at the HoHum RV Park in Carrabelle, Fl., sitting in the shade and looking at the Gulf of Mexico, when we are not fishing. August 7, 2015—Stuff happens. And sometimes when it happens, it gets very scary. One of those sometimes was today. 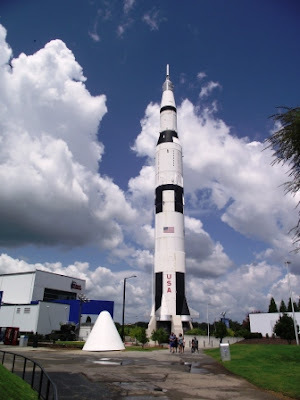 We had spent the night dry-camping at a Walmart in Henderson, Ky., and decided we would head toward Huntsville, Ala., where we would relax, go to the space center, and fish. 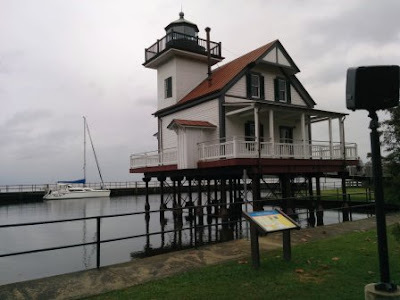 We found an ideal place on Lake Guntersville, about an hour from Huntsville. As you enter Alabama from Tennessee on the interstate (or any other highway for that matter), you drive in the mountains. They are not particularly high, but some grades are very steep. At one point, we were behind a truck that must have been carrying a very heavy load. It crept along at about 20 mph. 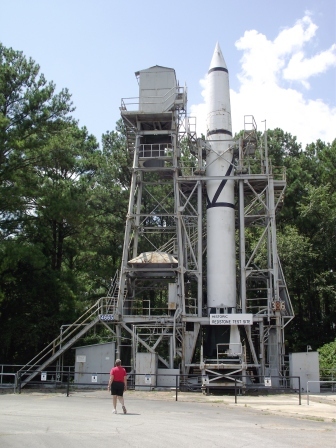 We didn’t rush or try to pass, because our own engine was laboring, too. When we got to the top of the mountain and a rest area, we pulled over for the engine to cool off. Steep grades going up mean steep grades going down. Frequent signs warn trucks (which, in this case, includes motorhomes), to shift into low gear to descend the mountain. Finally, the hard climbs seemed to be behind us, as we were traveling along at 60 mph (never higher) on Interstate 24. It was a level area. Suddenly we heard and felt two thumps and simultaneously a car passed us blaring its horn. Jim always drives in the right lane (because we never travel more than 60 mph). He immediately slowed, pulled over onto the shoulder, and stopped. He said his first thought was that we had blown a tire. Not so. That would have been bad. What happened could have been worse. We got out and ran to the back of the motorhome to see what had happened. I did not take a picture of the car butted up to the RV. But after I moved it back, in this picture you can see the broken tow bar and the sheared off safety cable. The motorhome got scuffed a bit from the car butting into it. Also, the mud flap has a bit of damage, which can be fixed. 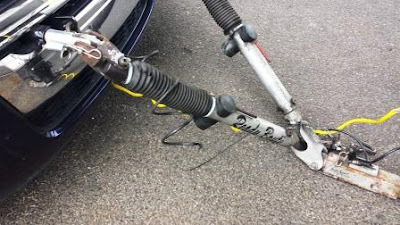 In addition to the tow bar, the hitch has two steel safety cables attached to the car. They are supposed to keep the car from running away if the tow bar comes off the car. 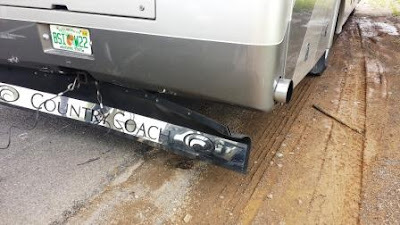 In this case, the tow bar came off the motorhome. The cable on the left in this picture sheared into two parts. Just below Jim's hand you can see the frayed wires in the electrical cable. It was unusable. The pin that held the tow bar to the motorhome’s hitch broke! It was a locking pin; lock sheared off and the pin came out. The tow bar dropped to the ground. One of the two steel safety cables broke. 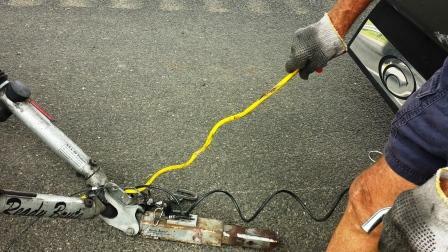 The electrical cable that plugs into the car to work its lights also frayed and was unusable. Fortunately, the car bumped into the motorhome instead of veering off the road. If that had happened, the car would have turned over, been totaled, and possibly would have caused other cars to collide. Jim had an extra tow-bar pin and reattached the car. I Googled RV dealers in the area. About 20 miles down the road, we were able to buy a new electrical cable. We finally arrived at the resort about an hour later than planned. 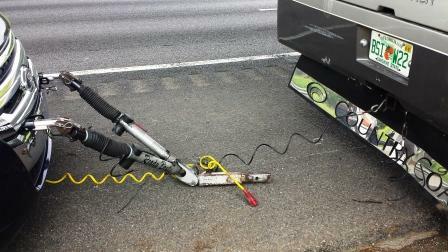 The moral of the story: Check the tow-bar pin (and every other pin holding the bar and the hitch) before every trip. August 6, 2015—Chicago. As cities go, it’s the best. Of course, I am biased, because I was raised a mere 45 miles from the Windy City. I even lived and worked there as an adult, from 1993-1998. Chicago has so much to offer, especially the food. You could eat in a different restaurant every day of the week (and I don’t mean the chain restaurants) and never repeat yourself and barely repeat the ethnicity of the cuisine. Jim and I settled into our campsite in Elgin, Ill., a western suburb, on Sunday, and then visited with Jennifer and her family. We then decided on how we were going to spend the few days we reserved to “tourist” Chicago: Monday, the Museum of Science and Industry; Tuesday, an architectural riverboat tour; and Wednesday, a visit to the Field Museum of Natural History and the Millennium Park. 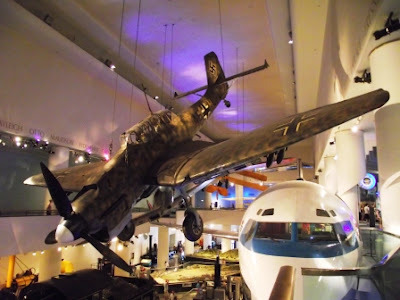 As a child, I had visited the Museum of Science and Industry (MSI) many times. 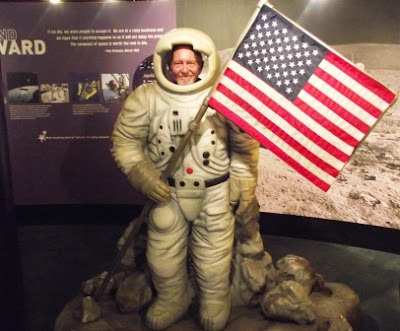 We loved going there, because even 50 years ago, the museum was interactive. I remember my favorite exhibits were the development of human life (fetuses in various stages of development); the coal mine; the U-boat; and the television exhibit, where we would walk in front of a huge TV camera (they were BIG back then, and only shot in black and white) and see ourselves on a monitor. Hi, Mom! I’m on TV! It was a blast. The fetuses are still there, and they are still as interesting to me today as they were when I was a child. 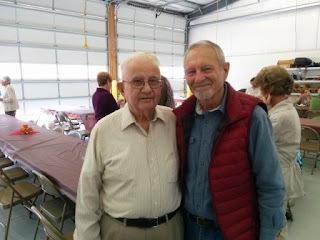 The coal mine and the U-boat (German submarine) are now paid exhibits; we chose not to visit them because both Jim and I had been in them before. The television exhibit I knew would not be there. Kids are not impressed with walking in front of a camera and being on television! They do it every day! Such is technology. Jim had not visited MSI since he was in the Navy in 1955, so he was eager to return. It was the one thing he wanted to do in Chicago. Interactivity is good, but the museum has too much interactivity, which results in too much noise. Too many things going on at one time. And too many kids. All the kids want to do is pull levers and push buttons; they don’t stop to read and learn anything. The science, too, has been dummied down to fit into an abbreviated attention span. 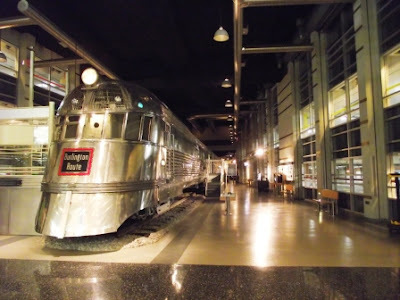 I think we both enjoyed the last thing we visited at the museum: The Silver Streak Pioneer Zephyr. This train had sat outside of the museum for many years. For that reason, I don’t think I had ever been in it. When the museum expanded (and also put its parking underground, a surprise to me), the train was brought inside and restored. We had a tour of the train and were able to go into several of the cars. While I lived in Chicago, a friend from Michigan visited me. 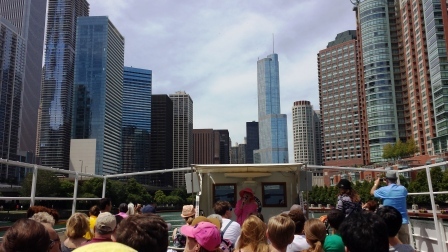 We did the Miracle Mile; we also took a boat tour of the city. My friend Sharon (a Peru Group 1965 pal) still works as a docent on the Architectural and Historical Cruises out of the North Pier Docks. When she offered complimentary tickets to a boat tour, I took her up on it. I knew we would both enjoy the cruise. The cruise offers a perspective of the city that few people get. I don’t know anything about architecture, but I appreciate the variety and differences in style among the many buildings that make Chicago unique. The docent (it was not Sharon, unfortunately) was excellent. She told us the history of buildings and could name all of the architects who created the high rises we gawked at. It was a wonderful 90 minutes. Just as I had enjoyed MSI as a kid, I also enjoyed going to the Field Museum. My favorite exhibits were the dinosaurs and the mummies. They are still there, but they have been improved. In fact, the whole museum has been improved. Although the Field Museum is much more traditional, it has interactivity. And the exhibits have been put together to capture and retain interest. 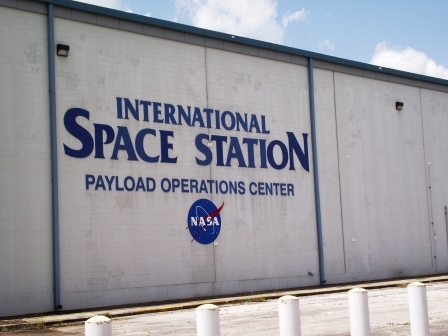 Jim and I felt we could spend days there; our time was too limited. If we return to the city, we will return there. The Field Museum has a lot of dinasours, but the most famous is Sue, this T-Rex in its central lobby. 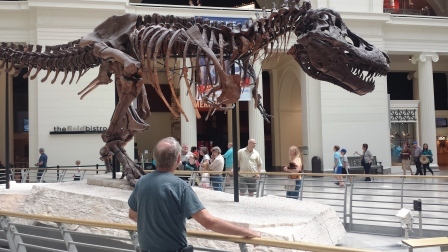 Sue is the most complete T-Rex ever found. Everyone told us we needed to visit Millennium Park, which serves as a town center for Chicago, with its free concerts and other events. 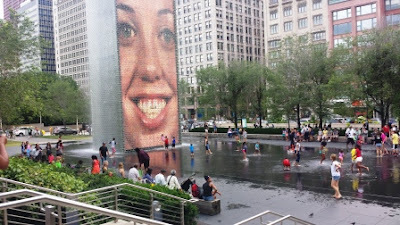 We were told we needed to see the Bean and the Fountain Faces (Crown Fountain). No one adequately described what these were. I don’t think I can describe the Bean. 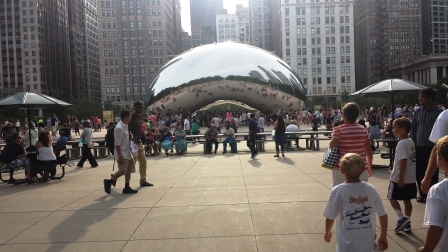 It is a huge piece of architecture that looks like, well, a bean! Its shiny surface acts a giant concave mirror. This is the Bean, a piece of architecture that is a centerpiece of Millennium Park, Chicago's new city center for cultural and fitness activities. The Crown Fountain has two towers--one on either end--that show continuously changing faces. The towers are actually fountains, which spill water into the area between them. Everyone is welcome to wade and splash in the shallow pool. In the center of the park is a pool fed by two fountains--tall structures on which surface faces continuously appear and change. The park offers more than these two features, but that was all we had time to see. We headed back to the subway, but made sure we stopped by a Garrett’s Popcorn Shop. I needed my “fix” of the Garrett Mix—half caramel corn and half cheddar cheese. Jim was disappointed the shop did not offer more varieties of popcorn. Me? I savored every kernel. The best part of our visit? Need I say it? 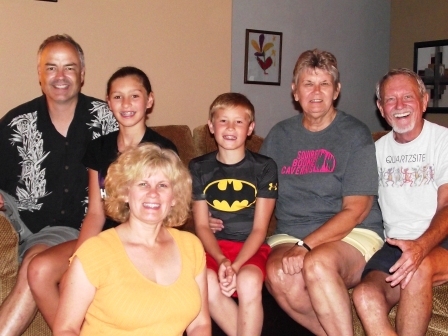 It was being with my family—my daughter Jennifer, her husband and my two Chicagoan grandkids. Nothing could beat that. Jennifer (front) Greg, Campbell, Ben, Linda and Jim. The best part of our Chicago visit. August 2, 2015--On our first trip up to Raleigh, N.C., to visit Rob and his family a few years ago, I searched everywhere for a campsite. I found one in state park only about five miles from his house. Beautiful location, right near a lake, in the woods. 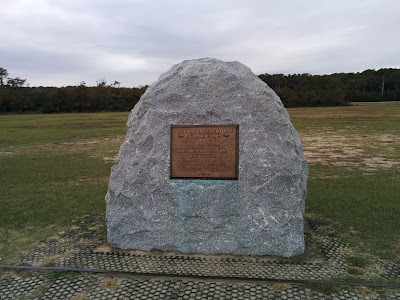 But camping in North Carolina was problematic: The park closed at dusk and rangers put a chain and lock at the entrance! In Florida, parks close at dusk, but campers are given a code to enter to get back in. In North Carolina, no such luck. You have to park the car outside of the gate and walk to your motorhome (in pitch black darkness). And that can be quite a hike. We did a work-around the first night we were there, by taking the motorhome to Rob’s house and parking it on a side street while we went to his birthday party. The next time we went to Raleigh, I made another search for campgrounds, and this time I discovered we could camp at the State Fair Grounds. I think we had electricity; I can’t remember if we had water. It, too, was only a couple of miles from his house, and we could come and go as we pleased. The campgrounds were also policed, so we were secure. No amenities, but who cared? We were there to park our traveling hotel. I learned from the Raleigh lesson to check local and county fairgrounds and parks for camping facilities. These are not usually listed on ReserveAmerica.com or in the Good Sam Camping Directory. On our trip to Chicago, I did my research and kept coming up with few alternatives. We wanted to camp near my daughter in Palatine, Ill., (a suburb), and we also wanted an easy commute into Chicago where we could become tourists. My daughter lives very close to a village park. I even called the parks department to find out if we could dry-camp there. We were told we could, if there were no events going on, but on reflection we decided that because the parking lot was on a busy street and would be unguarded, we did not want to leave our motorhome unattended there. • The truck staging area behind McCormick Place Convention Center. No electricity; no water; no sewer. Just a place to park for $35/night. That would be OK, except or two things: The neighborhood (especially at night) is not what I would call safe. And you have to walk about a mile to catch public transportation. We decided McCormick Place was not a good option. • Fish Lake Beach Resort. This RV campground is located in Volo, about 45 miles from Chicago, accessible by Metra train. It cost $35/night for electricity and water, no sewer. • Illinois Beach State Park. This park is located in Zion, way north of Chicago. Like Fish Lake, it is about 45 miles from Chi-town. It would be possible to catch the Metra. But both Fish Lake and Illinois Beach were quite distant from Jennifer’s house. I believe the cost was $25/night for non-residents. • Burnidge Forest Preserve In Elgin, Ill. This was the best option. No sewer hookup, but it did have electricity and water (on some sites). And best of all, it was 30 minutes from Jennifer as well as from the L-station near O’Hare. The only problem: The forest preserve did not take reservations. We decided to take a chance on getting a spot at the forest preserve in Elgin. I am glad we did. It was convenient and relatively inexpensive ($25/night for non-residents). If you are traveling to the Chicago area, I recommend this campground. However...be aware that the water has a very harsh iron taste ; there are no community showers, so you will have to take “Navy showers” in your RV, and you may need extra long hose for water hookup. (Not all sites have both electricity and water.) There are two dump stations. Taking public transportation is an adventure, but CTA drivers/employees are very helpful in advising how to get around the city. The city also posts CTA routes on nearly every block, so it is not difficult to figure out the system. Although I lived in Chicago for several years, I lived and worked in the fringes of the city. Both my workplace and my apartment were very suburban and were located on the far north side of the city. I rarely ventured into the city center, except when I had company who wanted to visit some of the attractions. Obviously, I am not a “big city” person. I prefer the calmness of the suburbs. But, every few years it is OK to fight the crowds. July 31, 2015—Visiting attractions in a new area is fun, but when you can do it with family (especially family you have not seen for a long time), the occasion becomes special. 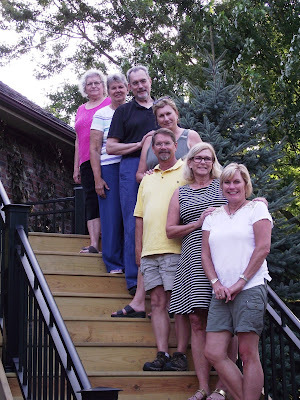 We spent three days in northeastern Indiana (Elkhart area), and then drove up to Marshall, Mich., to visit with Rob, Corky and the grandkids. I spent the first half of my life as a Hoosier, but I had never really visited the Elkhart area. I had just driven by on the interstate highway. The National Military History Center was interesting, but I do not have an optimistic outlook for it to survive. We were the only visitors. The attendance (who, I believe, was a volunteer) said that the museum had been forced to sell off a number of its exhibits a few years ago, but was not acquiring more. 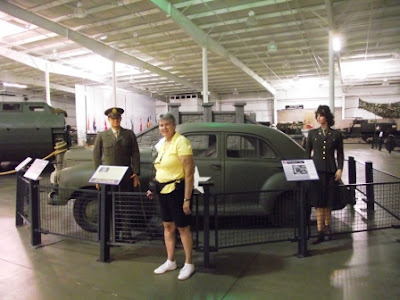 Linda stands with General Eisenhower and his secretary (also his mistress) in front of the car Ike used in WWII. The exhibits the museum had were interesting, especially the original vehicles used in several wars. Included with the price of admission was the Kruse Automotive and Carriage Museum, housed in the same building. It, too, was worth seeing, especially if you like old cars. This museum was not dedicated solely to cars; it exhibited some very old carriages and some very new cars. 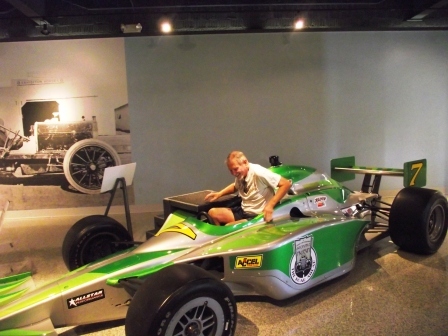 The Kruse museum displayed many types of vehicles, including this Indy racer. Getting into the racer was not too difficult, but getting out was hard, as Jim discovered. The seats on this antique motorhome don't look too comfortable. 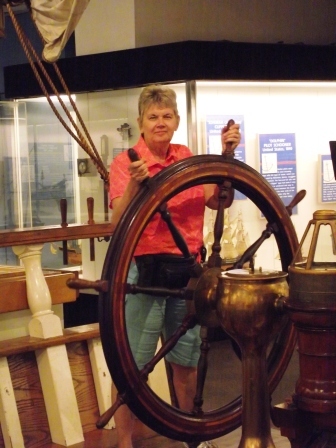 With the history of RVs firmly in mind, we asked the museum docent about tours of RV plants. 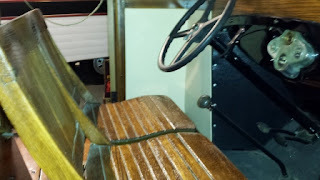 About 80% of all recreational vehicles in the United States are manufactured in the Elkhart area, and a number of the manufacturers gives tours. We went to the Thor Company, which manufactures all classes of motorized RVs: A’s, B’s, and C’s. 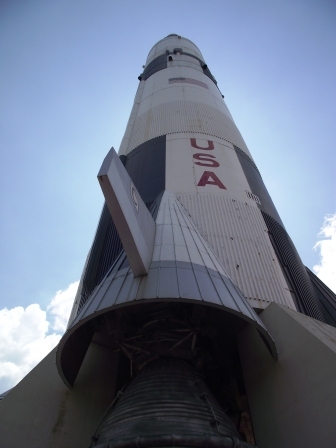 We would have preferred witnessing the assembly of a Class A; however, on the day we visited, the only tour available was for a Class C.
In our journeys, we have toured both the BMW manufacturing plant in Spartanburg, S.C., as well as the Corvette plant in Bowling Green, Ky. Both were highly automated, with probably 80% to 90% of the assembly done by robots. The plants were so clean and tidy that you could almost eat off the floor! 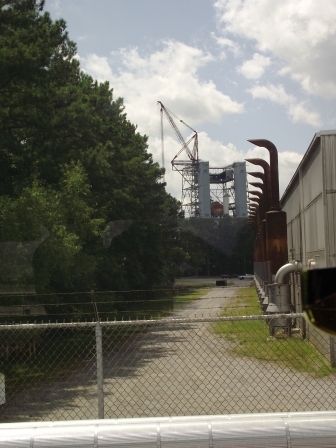 The Thor assembly plant was quite a contrast to the auto plants. About 90% of the RVs are assembled by human labor. And the manufacturing floor showed it. The plant was not as neat as the car manufacturers. 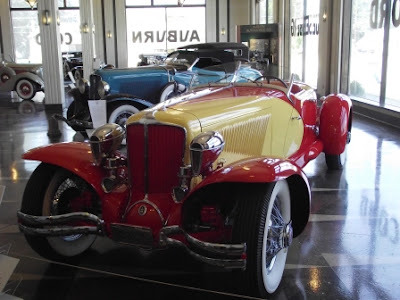 One of the attractions we visited was the Auburn Cord Duesenberg Automobile Museum in Auburn, Ind., about an hour east of Elkhart. This is a world-class museum, one that I have wanted to visit ever since I heard about it more than 25 years ago when I lived in Muncie, Ind. It was worth the time. The Auburn Auto Manufacturing Company operated in Auburn, Ind., from 1900 to 1937. It manufactured high-end automobiles. Some cost more than $8,000 in the late 1920s! Needless to say, that was a lot of money for that time period. 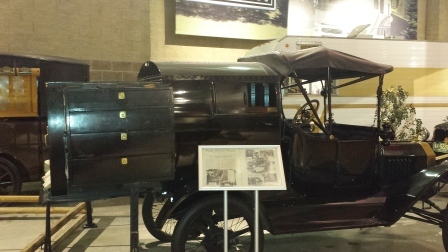 These autos were hand-assembled, unlike Model T Fords. Henry Ford introduced the assembly line in order to make cars affordable to the masses. Auburn Cords and Duesenbergs were meant for the elite—and the workmanship shows, even today in the 126 autos on display. 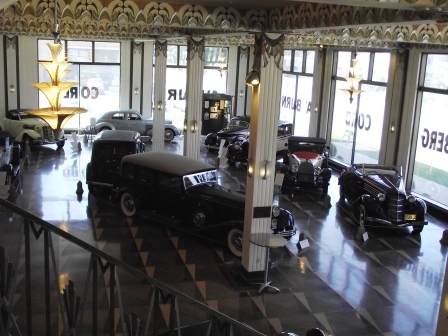 This photo captures some of the elegance of the art deco building, which was the original showroom for the Auborn Auto Company. 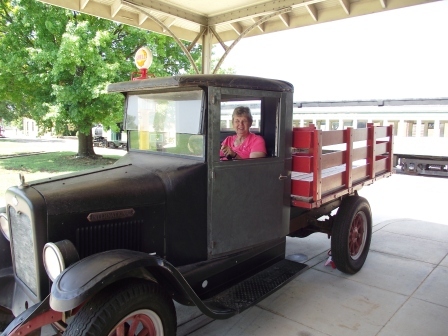 Most of us think antique cars were all painted black. That was Henry Ford's autos. These Cords and Duesenbergs were quite colorful. 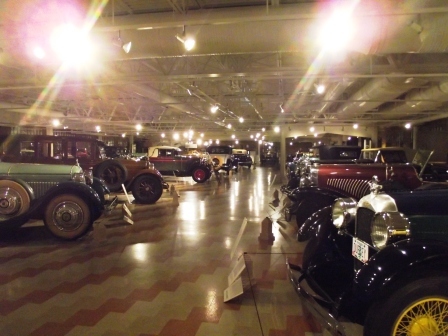 The museum is housed in the art deco building that once served as the showroom for these cars. It was an impressive building. 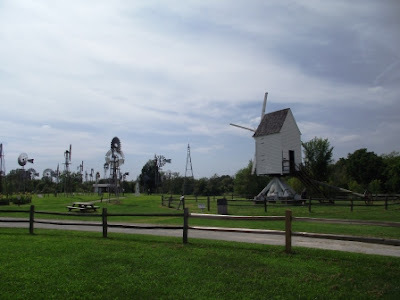 On the way back from Auburn, we saw a sign advertising the Mid-American Windmill Museum. It was an awesome visit. A fellow who was about 85 years old took our admission, and then proceeded to educate us about windmills. A more knowledgeable docent we would not have been able to find. After learning about why windmills were invented (to mill grain) and the types of windmills, he turned us loose to look at the 55 windmills on the museum’s property. Alas. This museum will probably cease to exist. Again, we were the only visitors. The docent said that the museum relies on volunteers, and few young people are interested in windmills. That is sad, because today, windmills are a great alternative source of energy. When we trekked out west a couple of years ago, we saw miles of huge windmills. We were pleased to see acres of these same types of windmills on our drive through Indiana. On our final day in Northeastern Indiana, we made a quick trip to Shipshewana Flea Market, advertised as the Midwest’s Largest Flea Market. It is open only on Tuesdays and Wednesdays from May through October. 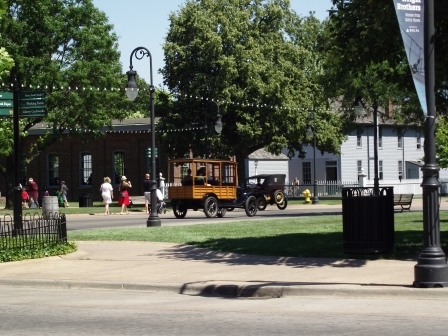 Greenfield Village is another attraction I have wanted to see, ever since I lived in Marshall, more than 20 years ago. 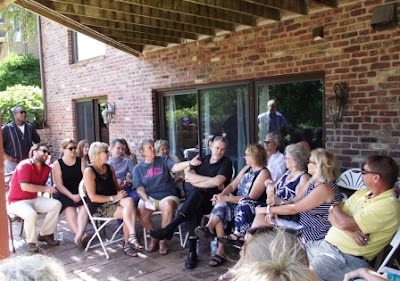 Henry Ford built the village—he actually brought in original buildings of significant inventors, scientists, and writers—as a school to preserve the history of America’s technological and cultural progress. It originally served as a private school. 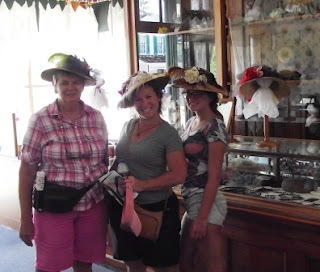 Corky, Maddie and I try on stylish hats at the millinery shop in Greenfield Village. An outdoor museum, the 255 acres of exhibits (and a working farm) are divided into five districts. I learned that Henry Ford had been a protégé of Thomas Edison. 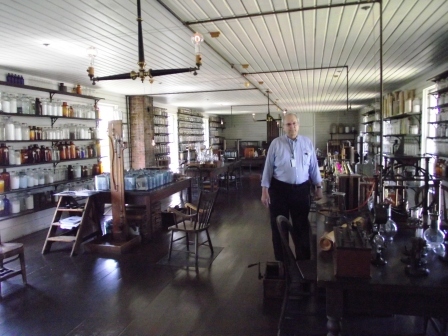 As a tribute to Edison, he brought Edison’s laboratory to the Village. He dedicated Greenfield Village on the 50th anniversary of the invention of the light bulb. Edison attended the dedication. Ford realized that Edison’s days were numbered, so as an additional tribute, he declared that the chair Edison had sat in during the dedication at Edison’s relocated laboratory should be nailed down and never moved. When the floors of the laboratory needed to be redone, the chair was cut out and replaced exactly, in order to keep Ford’s declaration true. Our visit with Rob and his family was too short, as it always is. But the trip to Greenfield Village was made more memorable because we shared it with family. Maddie, Jim, Rob, Linda, Jack, and Corky. Family.